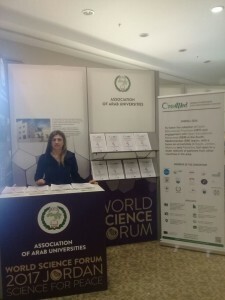 The Association of Arab University has presented the OpenMed project at the World Science Forum 2017 “Science for Peace” held in Jordan at the Dead Sea Convention Center on 7-11 November 2017. The event was meant to present and discuss the social and economic relevance, influence and responsibilities of science. The 4-day Forum included key sessions on topics including energy, water, food and the right to an education that unlocks opportunities in the world of today. The Delegates from over 100 countries were asked to examine the challenges and opportunities of the digital age, and the role that science must play in making our planet resilient and resource aware. WSF 2017 was held under the gracious Patronage of HM King Abdullah ibn Al Hussein, and Their Excellencies President Áder of Hungary and Director-General Irina Bokova of UNESCO. The event had the full support of the UN Secretary-General António Guterres and was attended by several Nobel Laureates and senior government representatives from around the world. 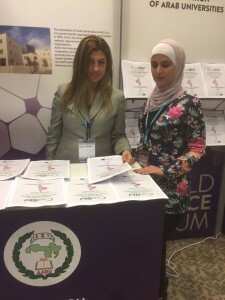 OpenMed was presented by representatives of the Association of Arab University taking part in the event. It was an opportunity to present the project and its results, through a roll-up and the distribution of the Compendium executive summary in English and Arabic.